Nice easy installation as usual with the Powerlink. Using on 10 speed mixed ultegra/105 with no issues. As a long time user of Sedis chains which served me well up to 8 speed groupsets I am expecting the same quality & reliability from the Sram chains. Sedis / Sachs became part of Sram in the 90's. Long lasting. Smooth shifting. Well lubed from the factory. Good Value chain with reasonable wear rate. Easy to fit when you get the knack of the connector. Quick link was very stiff and difficult to connect. I usually buy KMC which are easier, but I've used SRAM on 8 & 9 speed before without difficulty so was surprised this was so hard. 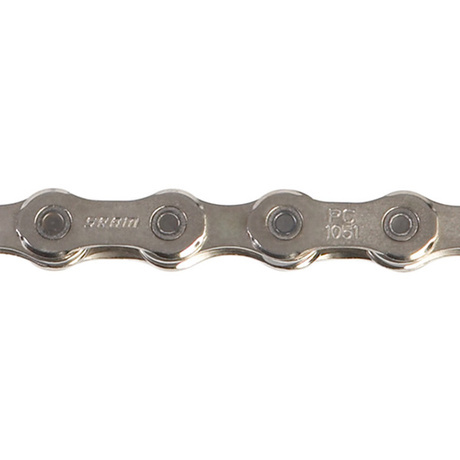 I always get SRAM chains, as the link makes replacing the chain so easy, and they are always good quality and seem to last really well, providing great shifting even when mixed with Shimano components. This one is a great compromise of quality and price. The chain arrived as advertised. Installed, it is working flawlessly. Great product; speedy delivery. I have been using this chain for several years now. Never had any problems. Great chain, better than the Shimano version as its much easier to get on and take off the drive train. I use this chain with Campagnolo 10v transmission and the adjustment was perfect . I like the PowerLink. Quick delivery and very good price shipping. Excellent value chain. Quiet, quick rolling and slick shifting. Split link makes it an absolute doddle to fit. A very noticeable improvement over a previous Tiagra chain on my winter bike. Surprisingly good quality for a chain billed as a mid-range item - it could easily complement higher spec groups. I'll be looking at SRAM for potential replacements for my Dura-Ace chain next. Love this chain, 3rd one I've order for my bikes now! The price and addition of powerlink makes it a winner every time I'm looking for a new chain. Better than most other makes at this price point. Outlasts them all. An improvement on Shimano chains with their fiddly pin jointing system. Great strong chain had the last one for 5,000 miles and it still didn't snap. I have always used the PC1051 with my SRAM Rival groupset. Good quality, reliable and great a value chain at Merlin prices. Look after it with regular cleaning and maintenance and it'll see you through 3000kms+. SRAM chains, in my opinion the best money can buy. Great chain, great price and fast shipping. Maybe the best chain for the money? I fitted this chain to complement a Shimano 105 5700 set. It runs smooth and silent. Gear changes are precise and crisp. It is extremely easy to fit with the powerlink, and it is bright and shiny, so looks good too. Time will tell, as to how well it wears. Excellent chain always used the Sram PC1051 on my Wilier with Campag chainset, never had any issues.